WASHINGTON — The Trump administration is considering hiring a "border" or "immigration czar" to coordinate the president's policies across various federal agencies. That's according to three people familiar with the discussions who spoke to the Associated Press on condition of anonymity because they were not authorized to discuss them publicly. NBC News has not independently confirmed the report. 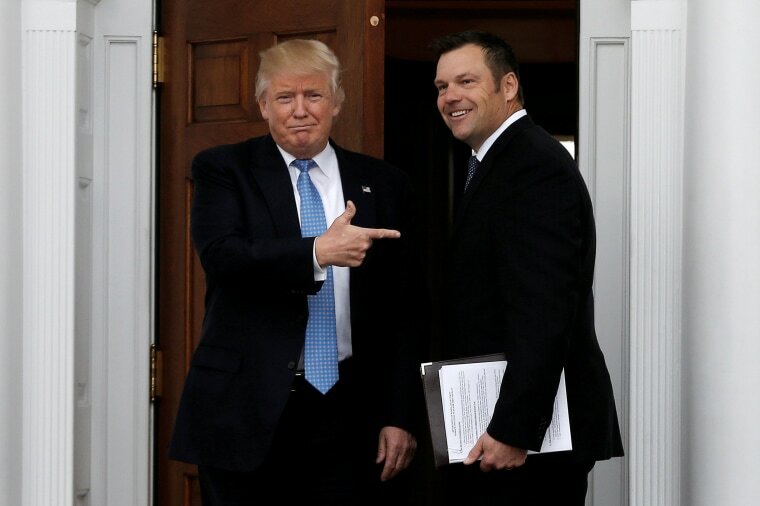 Trump is considering two potential candidates: Former Kansas Secretary of State Kris Kobach and former Virginia Attorney General Ken Cuccinelli — both far-right conservatives with strong views on immigration. It has yet to be decided whether the post would be housed within the Department of Homeland Security or the White House. White House press aides, Kobach and Cuccinelli did not immediately respond to requests for comment. The discussion comes as Trump is threatening to close the U.S.-Mexico border if Mexico doesn't halt all illegal immigration.